To help you choose the perfect go kart with pedals for your child, this guide will go over seven of the top options currently on the market. If there is one thing children love, it’s pedal go karts. Apart from being incredibly fun, these miniature vehicles allow the little ones to exercise and improve their coordination. So, here are our top picks! 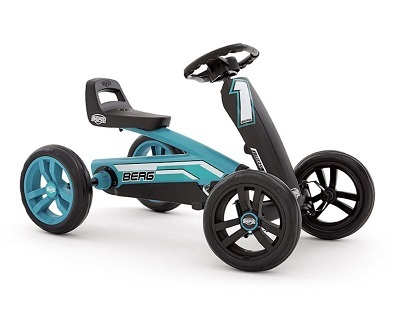 The Berg Buzzy Racing Kids Pedal Go Kart is a well-built little person go kart that will keep your kids entertained for hours on end. It is sturdy with durable tubeless EVA tires and a 4-wheel design for optimal balance. With 3 levels of adjustments for the seat and an adjustable steering wheel, it can be used by children as young as 2. This pedal cart comes with directional pedaling as it can be easily moved in reverse. It is a great miniature vehicle for kids to learn how to ride. So far, all kids love it. Unlike what the stereotype says, little girls also love pedal go karts. Sadly, however, many of the pedal go karts marketed towards girls are all looks and no substance. Luckily, the BERG Toys Girls Buzzy Bloom manages to be beautiful without neglecting functionality, durability and overall quality. Featuring adjustable parts, it can be modified to accommodate your growing child. Due to its high-quality EVA tires, it’s stable and provides great maneuverability without requiring too much effort from the child. 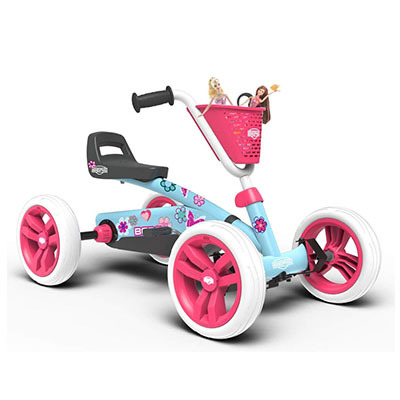 Taking all this into account, the BERG Toys Girls Buzzy Bloom is likely the best pedal go kart for small girls on the market. 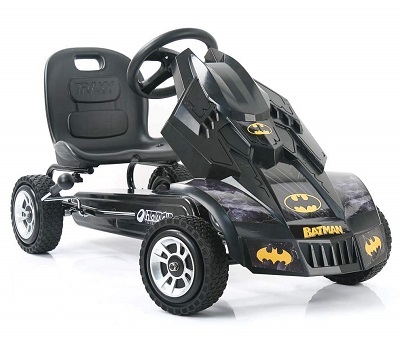 The Hauck Batmobile Pedal Go Kart is every young Batman fanatic’s dream come true. The overall quality of the hardware and design is stunning. 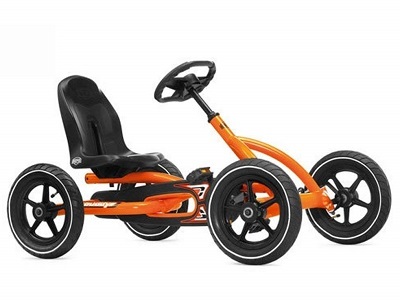 Th go kart looks very durable, it is easy to adjust (the seat has three adjustment settings), and very easy to assemble (less than 30 minutes). The steel tube frame is strong, and so are the low-profile hard rubber wheels. This pedal Batmobile is great for every crime fighting heroes everywhere. You can check our full review of the Batmobile pedal go kart here! 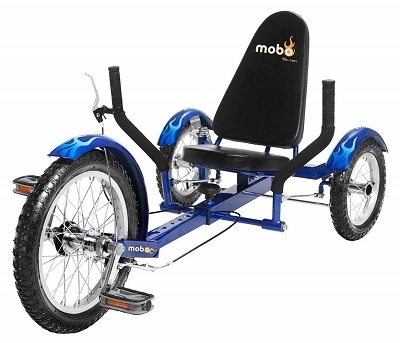 The Mobo triton pedal go kart trike is an unusual but very effective low impact exercise machine that your kid’s health can benefit from while he or she ahs tons of fun karting. This pedal go kart is a miniature recumbent bike that was designed for both exercise and cruising across smooth terrain. The frame is fully adjustable up to 52” (130 cm) in length so that it can easily fit kids or small adults up to 5’22” tall. You can coast downhill with it as long as you go slow, but there’s no way to climb steep slopes as the front wheel which provides all the power will need a running start first. The finish is excellent and the seat very comfortable. When they hear the words pedal go kart, some children get bigger expectations. That is where the BERG Toys Pedal Go Kart comes in. 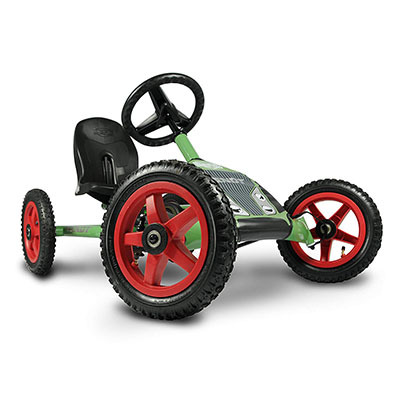 This huge, sturdy, and powerful pedal go kart is as durable, protective, and resistant as it looks. Its 15-inch air-filled pneumatic tires are all-terrain and extremely efficient. Apart from its size, this machine offers great control and maneuverability, making it one of the best pedal go kart options out there. With its sporty design, 8-Ball-Style hand brake, and the ability to control pedal speed, the Hauck Lightning is designed to offer young drivers an authentic driving experience both indoors and outdoors. This kart helps kids build strength, improve their coordination and stay in top shape as it is 100% leg power. We couldn’t believe the quality of this cart for the price. Th frame is powder coated steel tube, the seat is adjustable, comfortable, and with a safe sitting position. The assembly is a breeze and the unit is adjustable in size so it can fit the driver as he grows. 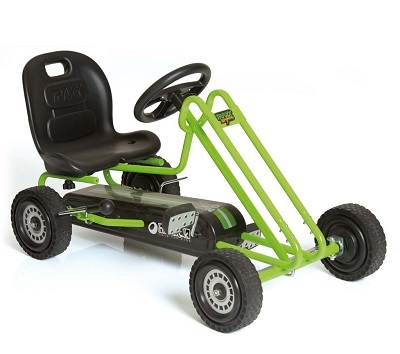 For the price, the Hauck Lightning is a very sturdy and well-made pedal go kart. You can’t go wrong with it. This is a very well-built and sleek looking pedal go kart your kid will love for a long time and you’ll wish you had one when you were his age. Everything about this cart is build for durability (powder coated steel frame, sealed bearings, 12” pneumatic tires, heavy duty spokes, and more.) The Berg Buddy pedal go kart can take plenty of abuse and will last for years to come. The quality of the product is extraordinary that’s why it landed on the first spot. It has a BFR Hub (Brake, Forward, Reverse) system that allows the cart to move forward, brake, and even reverse. To brake you’ll have to push back on the pedal just like you would with classic coaster brakes. The cart moves phenomenally smooth with maximum control even on uneven surfaces. All in all, this is a really great toy, we believe, worth every penny. Clean the wheels and bearings after each use. Oil the wheels and bearings (if required) once every six months. Use water with a small amount of detergent to wash the body once a month. Without a doubt, the seven products featured in this guide are among the best on the market. Apart from looking amazing, they are safe, durable, maneuverable and, perhaps most importantly, incredibly fun for children. Hopefully, you will deem one of them to be the pedal go kart for your child. Do you agree with our picks? Let us know in the comments section!